It’s about time to learn great white shark interesting facts. Great white shark (Carcharodon carcharias) has a torpedo-shaped body. It has a slate-gray color on top and white underbelly. These sharks can swim as fast as 35 miles per hour. They are highly migratory and mobile species. Let’s get on with fun facts about a great white shark. The great white is 15 to 20 feet long and weighs around 5,000 pounds. The largest great white shark ever recorded reaches a length of 23 feet. It was filmed off Guadalupe Island in Mexico. Its name is Deep Blue. 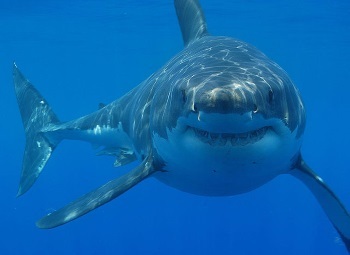 Great White Shark Lifespan: Great white has a lifespan of more than 70 years. Thus, it is by far one of the world’s longest-lived fish. Male sharks can survive for as long as 73 years while females have a lifespan of not more than 40 years. 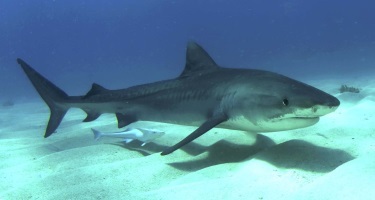 Male sharks reach maturity at 26 years of age while females take 33 years to mature. The rate of reproduction is very low. A litter size ranges fr om 2 to 14 pups at a time. White shark is a salt-water fish. It is present in huge numbers off the coasts of Mediterranean, South Africa (Dyer Island), Australia, Japan north eastern United States and Chile. What do Great White Sharks Eat? It is a carnivorous fish and prefers to eat marine mammals. 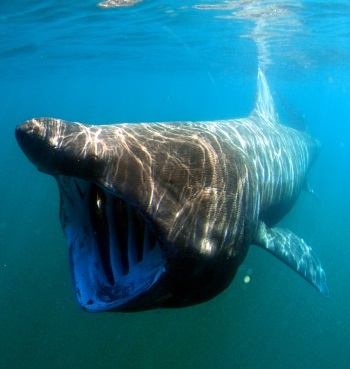 It feeds on seals, dolphins, sea otters, whales, tuna fish, sea turtles, porpoises and sea birds. Where do Great White Sharks Live? White sharks are thought to occupy just about every offshore and coastal waters. They are mainly found in the United States, Japan, Mediterranean, South Africa, Oceania, and Bosphorous. Like all sharks, white shark continues to swim to ensure it is not suffocated to death. This way it keeps breathing as oxygen-rich water flows over its gills. Recently, a white shark was filmed swimming gradually in shallow waters off Guadalupe Island with its mouth wide open. White shark does this when it is in a sleep-like state and conserves energy by keeping its mouth open. White sharks are probing creatures and tend to do in what is known as ‘taste tests’. Therefore, even though these sharks are involved in about one-half of all shark attacks to humans, most of these attacks are used to do ‘sample biting’ and not feeding on humans. Orca is the only known predator of white shark. According to the National Marine Fisheries Service, there are about 3,000 white sharks along Eastern North Pacific. But the precise number of white sharks is not known.